Porsche says the eighth generation of its iconic 911 will once again raise the bar for luxury sports cars when the Carrera S version arrives at dealers this month. The 911 has high-tech new assistance systems such as thermal imaging cameras for better vision during night driving and “wet mode” to improve handling on slick surfaces. This is needed because the 911 is much more at risk of aquaplaning due to its light weight and broad tires. Additional upgrades include standard LED headlights and a new subframe that isolates engine vibrations before they penetrate into the cabin. Engineers have also adapted the sports car for a digital world, replacing four of the five dashboard dials with virtual ones using two high-resolution 7-inch displays that flank the centerpiece analog rev counter on both sides. The rev counter was retained because it is considered part of the car’s signature look. The high-definition screen in the middle console grew nearly 4 inches to 10.9-inches diagonally compared with the previous generation model. The rear-mounted, six-cylinder boxer engine from the previous generation car served as the basis for the new 911’s powertrain, but engineers coaxed an additional 30 hp out of the 3.0-liter twin turbo. Now its output hits a maximum of 444 hp at 6,500 revolutions. A new eight-speed dual-clutch transmission from ZF Friedrichshafen applies the 530 newton meters of torque to the wheels. 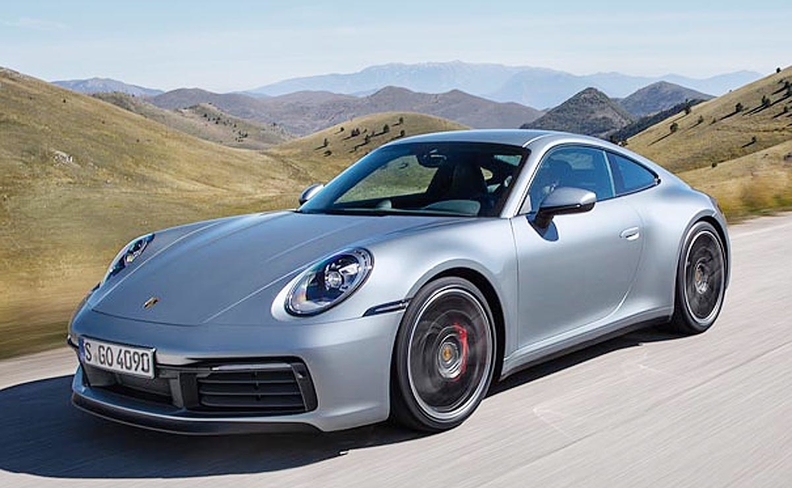 The 911 accelerates 0 to 100 kph in 3.7 seconds, four-tenths of a second faster than the previous-generation model, even without the optional Sport Chrono Package. The Carrera S has a top speed of 308 kph. “I can promise you it will once again be the best 911 of all time,” said Thomas Krickelberg, head of the 911 model line. The 911 is far from being the brand’s top-seller - that is the Macan crossover - but it represents the core of the brand because it lends its prestige, design and sporty character to all other Porsches that have followed. Unlike other sports cars, volumes do not drop off sharply after the first one or two years. “It provides a relatively stable, predictable source of demand with about 30,000 units sold each year,” Krickelberg said. The seventh-generation 911 was the most successful so far with nearly 218,000 built since its debut in 2011. No electrification will be offered initially, but Porsche CEO Oliver Blume has said he is tending toward introducing a lighter, full-hybrid as an option rather than a plug-in hybrid, most likely halfway through the new 911’s life cycle. To better reduce emissions, Porsche is replacing the solenoid-operating injectors with a new piezo-activated system for the first time. Found in many common-rail diesel systems, it can inject fuel into the cylinder as often as five times in a cycle and precisely time when to spray the ultrafine droplets. This leads to a more controlled and complete combustion process with fewer harmful by-products. In combination with the gasoline particle filter, which will not be available in all global markets, they ensure the vehicle meets the latest emission regulations in Europe. Porsche has given the latest 911 a more muscular exterior. It also has a safety system to prevent aquaplaning. Safety: Sensors located in the front wheel arches indirectly measure the amount of water under the tires. If they detect risky road conditions, the car will prompt a driver to switch to “wet mode,” an intelligent mix of various assistance systems that help prevent aquaplaning. Chassis: The mixed tire sizes and a wider track width in the front and back creates greater lateral stability when cornering. Lightweight: The 911’s sheet metal is almost entirely aluminum and there is an increased use of extruded aluminum profiles that reinforce the body. The share of steel has more than halved to 30 percent compared with the predecessor model. Carbon counter: The new 911 features a Web-based Porsche Impact emissions calculator to offset individual CO2 footprint. Drivers have a choice of internationally certified projects they can support either in Europe or emerging markets such as Vietnam and Zimbabwe.